British poster with a circular framed portrait of the king dressed in a military uniform, and a red map of the United Kingdom. 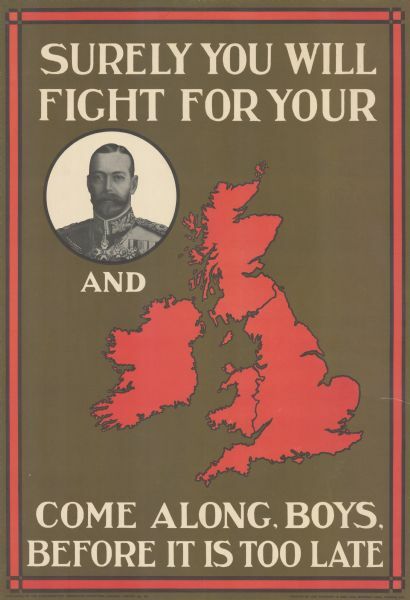 Text reads: "Surely You Will Fight for Your King and Country. Come Along, Boys, Before it is too Late." Text on portrait reads: "W. & D. Downey, 57 and 61, Ebury St., London, S.W." Text at bottom reads: "Published by the Parliamentary Recruiting Committee, London. — Poster No. 83." and "Printed by Jas. Truscott & Son, Ltd., Suffolk Lane, London, E.C."